To have a priority port must the value be high or low : will a port with the value of 32 be preferred over another port at 128 ? The lower priority will win the election process. You don't need to change it on both sides you only need to worry about which one is the root switch. and you want port 3 on SW1 and SW2 to be the designated (or in this case the root port) and port 1 to be discarding/ the redundant link. On SW1 set port 3's priority lower than port 1 (or like in your example port3 = 32 port 1 = 128). Since SW1 is root, the BDPU packets will carry that information to SW2 to help with it's port election process and it will see the priorities coming in on those ports and elect port 3. Most would want to use cost instead of priority. Cost is also lowest = choosen path. If I remember well, priority is only local and come after cost in root path selection. Here is the configuration, it is necessary that the connection AF has priority and that it is managed automatically by the Netonix switches. 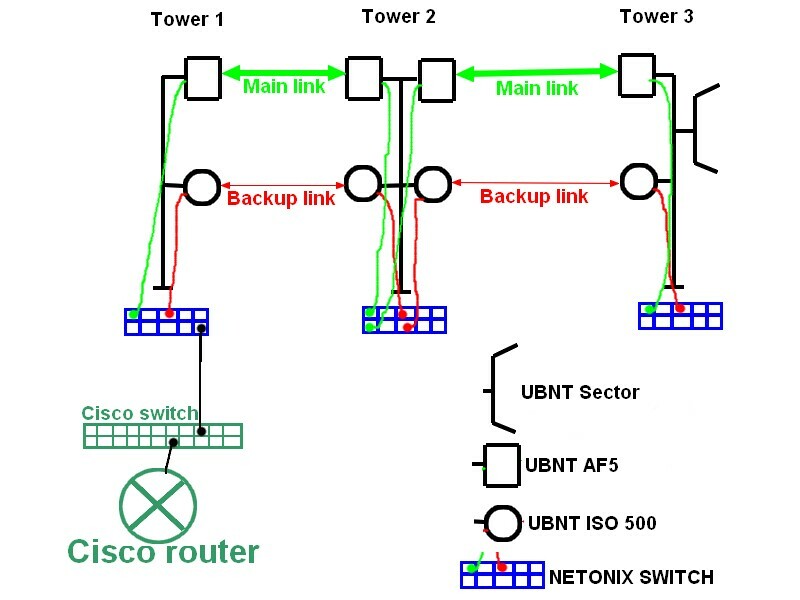 For example if the AF of the tower 1 is down, the switch of the tower 1 and 2 must pass the traffic on the UBNT ISO (backup link), between the tower 2 and 3 it is necessary that the traffic pass on the AF (main link). Is it possible to do this in order to manage two paths (Master/Main Link on AF / Backup Link on ISO 500) on the Netonix switches? Just set an higher cost on the ports where you connect the backup link (on port 5 and 6), or set a lower one on ports 1 and 2, depending on your growing plan. Make sure the tower 1 netonix switch, or the cisco switch, is the root switch. To know if you should enable STP on the Cisco switch or not, we would need to see the whole network. If STP is enabled on the Cisco switch, the're a good possibility that the Cisco switch will be root by default since the mac address will probably be lower than Netonix but I wouldn't take chance and lower the global STP priority of the switch in the Cisco. If the root switch must be the Netonix of tower 1, just lower the global priority lower than the default 32768 for the tower 1 Netonix. Also, if doing WISP, always disable STP on ports facing customer, use loop detection instead. Thanks Mike for the answer ! => If the Cisco configuration is correct, now what is the correct configuration for the Netonix to have a main link and a backup link ? Last edited by Seb65 on Thu Apr 25, 2019 7:26 am, edited 1 time in total. Nobody has an idea about the configuration of the top ? 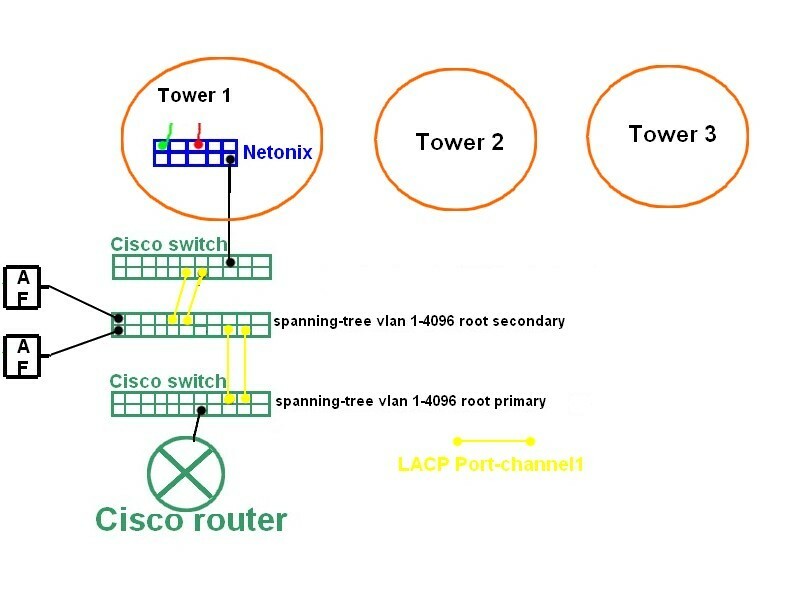 If the're not multiple path between the netonix and the Cisco, STP is not needed and anyway, pvst and rstp are not compatible since pvst is cisco proprietary. Also, your root primary should be the device connected to the Cisco router. mike99 wrote: If the're not multiple path between the netonix and the Cisco, STP is not needed and anyway, pvst and rstp are not compatible since pvst is cisco proprietary. It seems to me that the Netonix will work in LACP mode with a Cisco no?